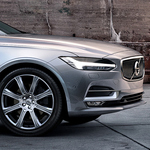 What Performance Features are in the 2019 Volvo V90? What aspects of modern luxury wagons are convincing drivers to make the switch from other types of vehicles? While the design and interior features are a major selling point, the performance features surprise many people. That is why we here at Fields Volvo Cars Waukesha are so excited about the all new 2019 Volvo V90! First, lets take a look at the various driving modes that come equipped in this vehicle. There is an eco mode for when you want to conserve fuel, and an off road mode for when you want to just get away from it all for the weekend. Also, the dynamic mode increases the performance of the vehicle almost immediately. Next, drivers will all appreciate the eight speed transmission that comes standard on all trims of this vehicle. This way, whether you're going on a leisurely stroll across town or running late to work, this car will perform for you.